Ald. Proco Joe Moreno will support zoning changes for a 59-unit apartment building at 1822-50 W. Chicago Ave. Current zoning allows 39 apartments. The project's in the City Council's Zoning, Landmarks and Building Standards committee, and is expected to come before the Plan Commission this fall. East Village Association members voted against the zoning changes on May 5. A letter to the alderman notes members' objections, and efforts to develop the property as an extension of Commercial Park. The developer is being allowed to "buy out" of two of the six affordable units that would be required with this zoning change. It appears that Moreno will require Fifield to build four of the six apartments, but simultaneously allowed the developer to reduce a pledged contribution to Commercial Park from $200,000 to $100,000. "The East Village Association believes that Ald. 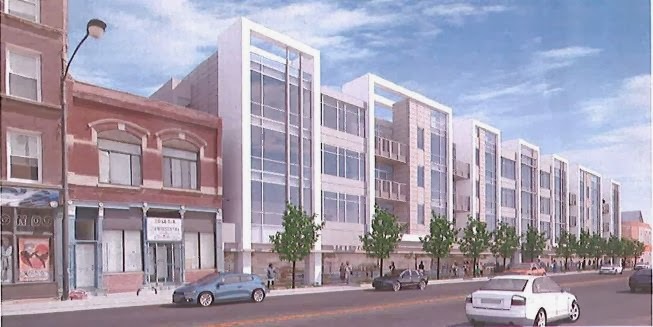 Moreno's approval of this project is a retreat from his longstanding commitment to require developers to actually build affordable housing in the 1st Ward," President Neal McKnight says in a statement. "The Fifield Cos. made no showing of a financial hardship and if the inclusion of the small number of affordable units creates a hardship, they should build within existing zoning. "We continue to hope that Alderman Moreno will change course and seek and at a minimum seek an amendment to the planned development ordinance requiring the construction of all of the affordable units," McKnight said. Raymond Valadez, Moreno's chief of staff, "believes that the developer patiently waited an inordinate amount of time, at the request of the East Village Association, while EVA and the Commercial Park Advisory Council determined whether it was financially feasible to purchase the land." What's happening to Chicago avenue is criminal. Not as bad as the horrific "architecture" on Division but we are catching up fast. What about parking for these 59 units? It not one of those scam TODs is it?! PARKING MUST BE PART OF THE DESIGN!! !